VATICAN CITY (CNS) — Pope Benedict XVI warned visiting U.S. bishops that “radical secularism” threatens the core values of American culture, and he called on the Church in America, including politicians and other laypeople, to render “public moral witness” on crucial social issues. The Pope spoke Jan. 19 to a group of U.S. bishops who were in Rome for their periodic “ad limina” visits, which included meetings with the pope and Vatican officials, covering a wide range of pastoral matters. Opening with a dire assessment of the state of American society, the Pope told the bishops that “powerful new cultural currents” have worn away the country’s traditional moral consensus, which was originally based on religious faith as well as ethical principles derived from natural law. The Pope said that many of the visiting bishops had told him of “concerted efforts” against the “right of conscientious objection … to cooperation in intrinsically evil practices” — an apparent reference to proposals by the U.S. Department of Health and Human Services, opposed by the U.S. bishops, that all private health insurance plans cover surgical sterilization procedures and artificial birth control. In response to such threats, Pope Benedict said, the Church requires an “engaged, articulate and well-formed Catholic laity” with the courage and critical skills to articulate the “Christian vision of man and society.” He said that the education of Catholic laypeople is essential to the “new evangelization,” an initiative that he has made a priority of his pontificate. The Pope was not specific about the bishops’ relationship with such politicians, merely encouraging the bishops to “maintain contacts” with them and “help them understand” their duty to promote Catholic values. 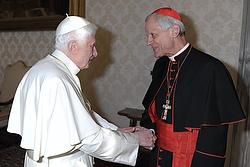 Before the speech, Cardinal Donald W. Wuerl, archbishop of Washington, greeted the Pope with brief remarks that recalled his 2008 visit to the United States. The Pope addressed bishops from the District of Columbia, Maryland, Delaware, Virginia, West Virginia, the U.S. Archdiocese for the Military Services, and the Virgin Islands.